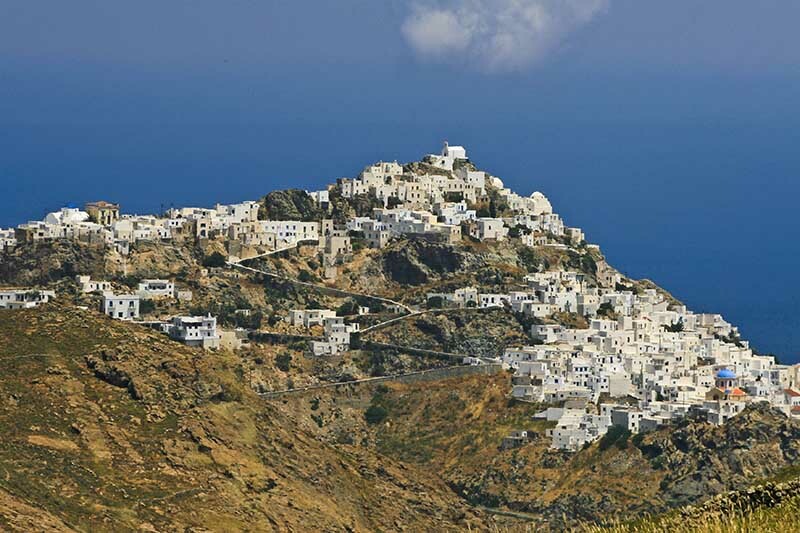 The Serifos Chora is divided in Ano and Kato (upper and lower town) and it is built on the top of a steep rock. There are cube-shaped houses looking like staircases- as the terrace of one house becomes the balcony of the other. It was built on a steep hill slope. Following the shutting down of the mines, both the upper and the lower Chora were deserted. 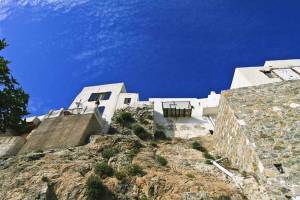 Thanks to some Greek and foreign visitors who bought and restored many of the abandoned houses, in order to be used as summer houses, the settlement remained alive and what is more without altering its traditional character. Agios Athanasios square dominates the Ano Chora where the church of Agios Athanasios and the neoclassic building of the City Hall (1904) are located. In the old days, the square was full of life , with the taverns being full of people, something that happens in our days during the summertime, as it serves as a passage for those who visit the castle and those who are enjoying the ouzo bars and the restaurants. Here you can also find Thidyra shop. Kato Chora has its own identity. The church of “Evagelismos tis Theotokou” with the large square is the centre of the settlement. The Lotzia. On the right of the Town Halls’ square, following Perseus street and the signpost towards the castle, you will find the Lotzia, which was the western gate of the fortified town.